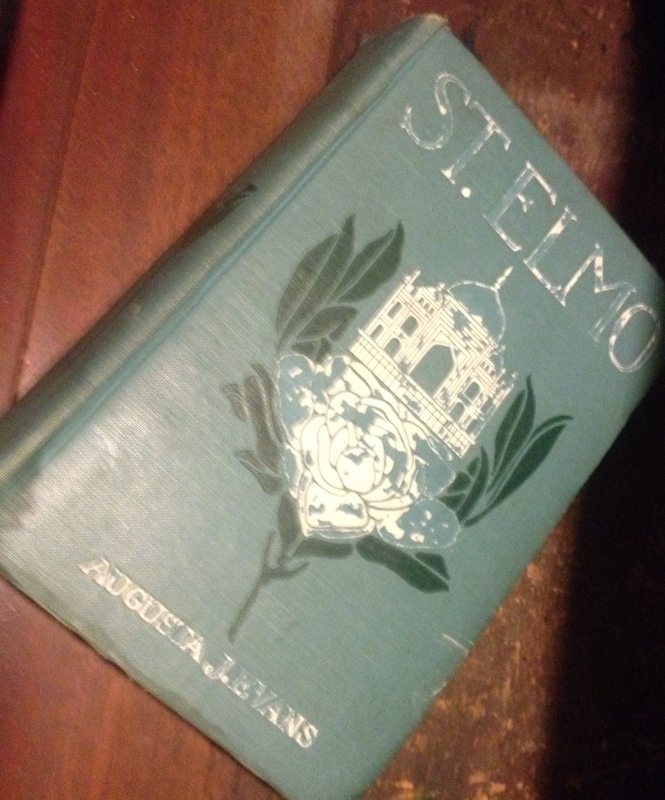 ST. ELMO, by Augusta Jane Evans, was written in 1866. ST. ELMO was the third bestselling novel (after BEN HUR and UNCLE TOM’S CABIN) in the 19th century, equivalent in popularity to the 20th century novel GONE WITH THE WIND. In fact, according to Margaret Mitchell’s biography, Rhett Butler was modeled after St. Elmo Murray. The book inspired plays and was adapted to film in 1923. The ST. ELMO silent film, starring John Gilbert and Bessie Love, is sadly a lost film. The story begins at the foot of Lookout Mountain in Chattanooga, Tennessee. (Today that part of Chattanooga is named after the book.) “Edna Earl” is an orphan of humble means living with her grandfather. Early one morning, Edna stumbles upon a duel in which a man is killed near her home. Having witnessed the duel from beginning to end, she is permanently traumatized by the incident. The victim’s body is laid out in her house. When the victim’s wife comes to see the body, she dies from the shock. Edna Earl is horrified by the damage that the senseless duel has caused. Meanwhile, Edna adores her grandfather, who is a blacksmith. One day on the way to her grandfather’s shop, she encounters a gruff, arrogant man who is in need of a blacksmith to replace a horse shoe. Edna directs him to her gran dfather’s shop. The man is impatient, swearing as he waits for her grandfather to finish the job. As the man rides away, Edna’s grandfather says to her: “He is a rude, blasphemous man.” Edna notices that “the rude blasphemous man” drops a book as he rides away in haste. The book is a leather-bound copy of DANTE with the initials SEM inside the flap. Edna learns to treasure the book for its text and illustrations. When her grandfather dies unexpectedly, Edna tries to make it on her own. Just 13-years-old, she boards a train bound for Georgia. The train wrecks. Many die but Edna survives and is rescued by one of the locals, “Ellen Murray,” a wealthy widow. Edna begins to recover under the widow’s care. The two bond and Mrs. Murray decides to raise the orphan, as if she were her own child. Then, something happens that shatters Edna’s contentment. Mrs. Murray’s son arrives home. The conflict in their relationship stems from the issue of dueling, a common practice in Augusta Evans day. But the sub-theme–feminism vs. anti-feminism–is the theme that catches the modern reader’s attention. When I say “feminism,” I don’t feminism as we define it today. The book was written long before women had the right to vote. So while “Edna Earl” disapproves of women in politics, she believes that men and women are intellectual equals and applauds women with literary careers. The book is filled with explosive, romantic tension that just won’t quit. The characters are not particularly realistic; instead, they are larger than life, and that’s what makes the book fun to read. However, ST. ELMO is not easy to read. You will find allusions to mythology mind-boggling at times, but if you like character-driven novels, you won’t be able to put it down. You have to read it more than once to truly appreciate this book. Parts of the book are hilarious, but you might miss the humor the first time around. Much of it is tongue in cheek. ST. ELMO is enjoying a resurgence of popularity today. Deadra Lore of St. Augustine, Florida, is writing a ST. ELMO study guide that explains the foreign expressions, mythical references, and difficult words peppered throughout the story. Several years ago, filmmaker Robert Clem created a docudrama called “The Passion of Miss Augusta,” which highlights scenes from ST. ELMO and compares the fictional “Edna Earl” with her creator, Augusta Evans. He explores the feminist side of Augusta Evans with riveting drama and insight. This entry was posted in Augusta Evans Wilson, films, John Gilbert, romance, St. Elmo and tagged Gone With the Wind, Robert Clem, ST ELMO, The Passion of Miss Augusta on January 6, 2016 by Sheryl Wright Stinchcum. One of my favorite flowers is oxalis. I never knew the flower existed until I read about it in ST. ELMO by Augusta Jane Evans. In the following paragraph, “Edna Earl” sees the flower and associates it with “St. Elmo Murray,” the man she is trying to resist. Edna bent over her flowers, and recognizing many favorites that recalled the hothouse at Le Bocage, her eyes filled with tears, and she hastily put her lips to the snowy cups of an oxalis. How often she had seen just such fragile petals nestling in the buttonhole of Mr. Murray’s coat. (Page 290, ST. ELMO). 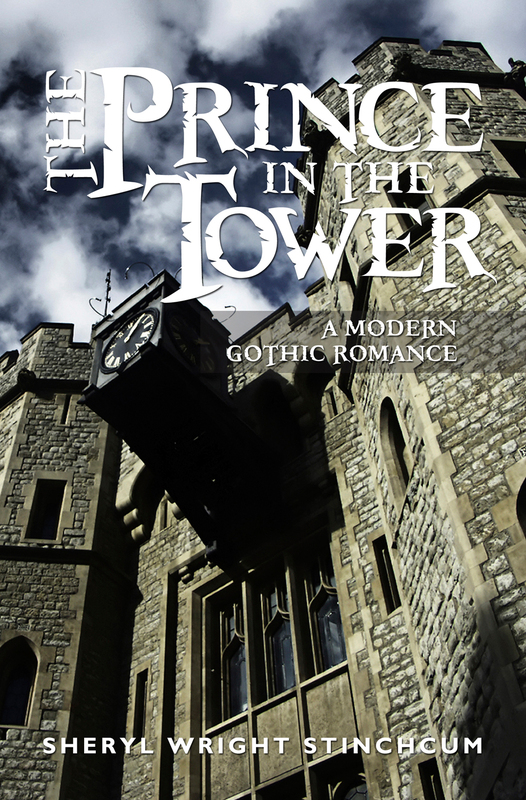 I was thinking about that and other passages in ST. ELMO when i wrote the following scene between “Effie Beller” and “Gideon Baldwin” on page 69 and 70 of THE PRINCE IN THE TOWER. They were standing in the sun room, and he was preparing to leave through the back door. 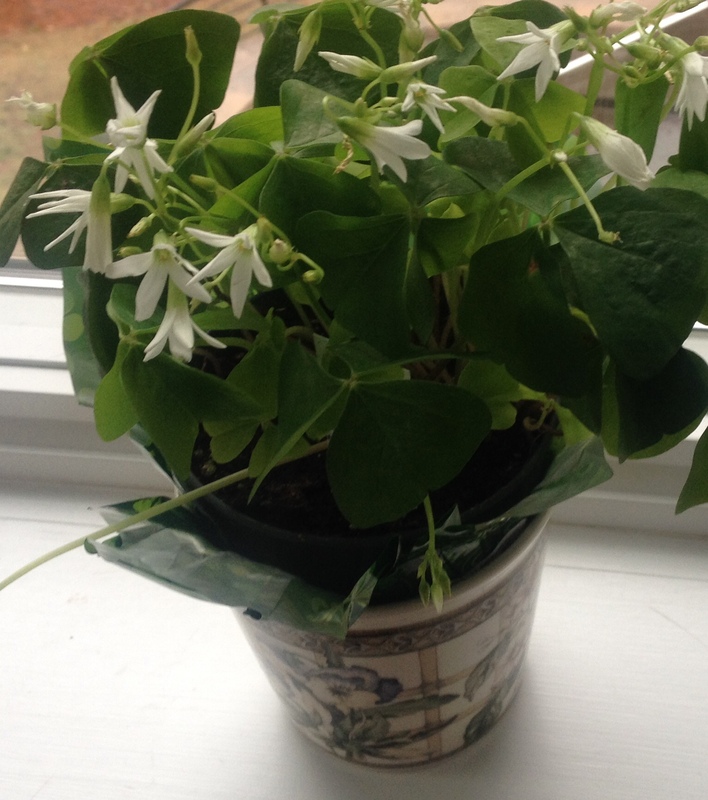 Impulsively she snatched a spray of oxalis from a ceramic pot and held it up to his lapel. “Neither was he.” With trembling fingers, she slipped the posy into his buttonhole and started to walk away, but he seized her arm and turned her around. He crossed the room to his mother’s dresser and returned with a handful of tissues. Every flower has a special meaning–or so I thought. I based this belief on a book called “The Poetry of Flowers.” i was sure I could look up oxalis and find a romantic meaning. However, the flower is not even mentioned in the book. 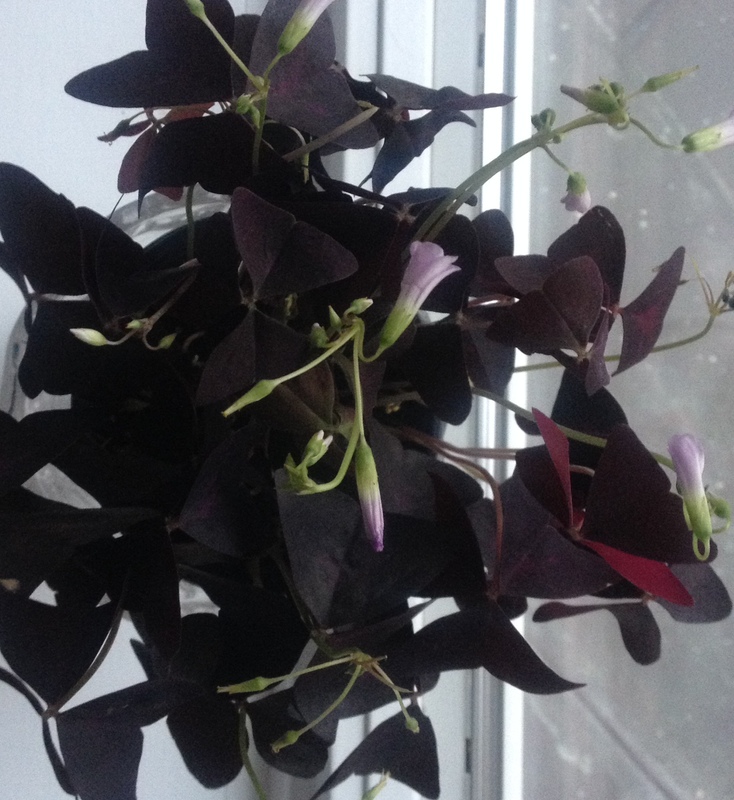 Some refer to oxalis simply as “clover” or “a creeping weed,” hardly a romantic description of my hallowed plant. Finally, I learned that oxalis is a member of the wood sorrel family. Wood Sorrel means “Joy” and “maternal tenderness,” and that is an accurate description of the role that oxalis plays in THE PRINCE IN THE TOWER..
Often referred to as “shamrock,” oxalis is easy to find this time of year. I found two different types of oxalis in a St. Patrick’s Day display at the grocery store. My favorite is “snowy” oxalis, but you can also find oxalis with purple leaves and lavender flowers or with green leaves and pink flowers. This entry was posted in Augusta Evans Wilson, fiction, films, John Gilbert, Nature, novels, romance, THE PRINCE IN THE TOWER, Writinhg Fiction and tagged Augusta Evans Wilson, Augusta Jane Evans, clover, oxalis, shamrock, ST ELMO, THE PRINCE IN THE TOWER on March 11, 2015 by Sheryl Wright Stinchcum. 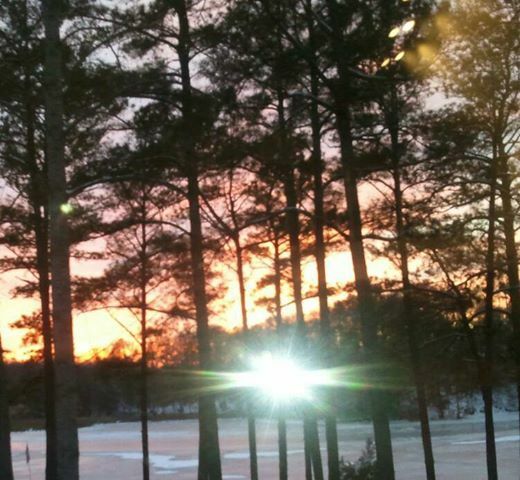 How can anyone describe something as spectacular as a sunset? Nothing can take the place of a photograph, can it? Augusta J. Evans (1835-1909) creates a credible word picture of a sunset on page 116 of ST. ELMO, and the twilight that follows sets the eerie stage for the entrance of the Byronic protagonist “St. Elmo Murray.”. The sun went down in a wintry sky; the solemn red light burning on the funeral pyre of the day streamed through the undraped windows, flushed the fretted facade of the Taj Mahal, glowed on the marble floor, and warmed and brightened the serene, lovely face of the earnest young student. As the flame faded in the West, where two stars leaped from the pearly ashes, the fine print of Edna’s book grew dim, and she turned the page to catch the mellow, silvery radiance of the full moon, which shinning low in the east, thew a ghastly lustre on the awful form and floating white hair of the Cimbrian woman on the wall. But between the orphan and the light, close beside her chair, stood a tall, dark figure, with uncovered head and outstretched hands. She sprang to her feet, uttering a cry of mingled alarm and delight, for she knew that erect, stately form and regal head could only belong to one person. It’s no secret that Augusta J. Evans is my favorite novelist and that ST. ELMO inspired me to write THE PRINCE IN THE TOWER. 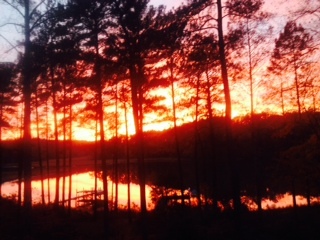 This entry was posted in Augusta Evans Wilson, fiction, inspiration, John Gilbert, novels, romance, THE PRINCE IN THE TOWER and tagged Augusta Evans Wilson, Augusta J. Evans, ST ELMO, Sunsets on March 3, 2015 by Sheryl Wright Stinchcum. No one creates characters out of thin air. They are bits and pieces of people you know, have seen, or read about. Sometimes the main character has a lot in common with the author. I’ve never read a Stephen King novel, but I know that his main character is often a novelist. While writing THE PRINCE IN THE TOWER, I identified with several characters, especially “Effie Belle Butler,” an airbrushed image of me, with all of my strengths and none of my weaknesses. Writing a novel is like daydreaming about who you would like to be and who you would like to be with. This entry was posted in fiction, inspiration, novels, romance, THE PRINCE IN THE TOWER, Writinhg Fiction and tagged Christian fiction, Christian Romance, creating fictional characters, fiction, fictional characters, Stephen King, THE PRINCE IN THE TOWER: A Modern Gothic Romance on April 25, 2014 by Sheryl Wright Stinchcum. 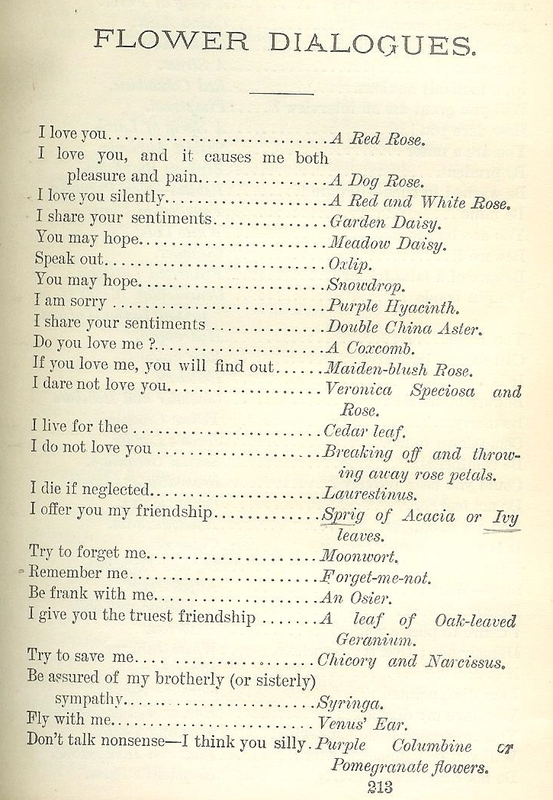 People who lived in the nineteenth century assigned meaning to each flower. Choosing flowers for a bouquet was a delicate matter because you wanted to send the right message. 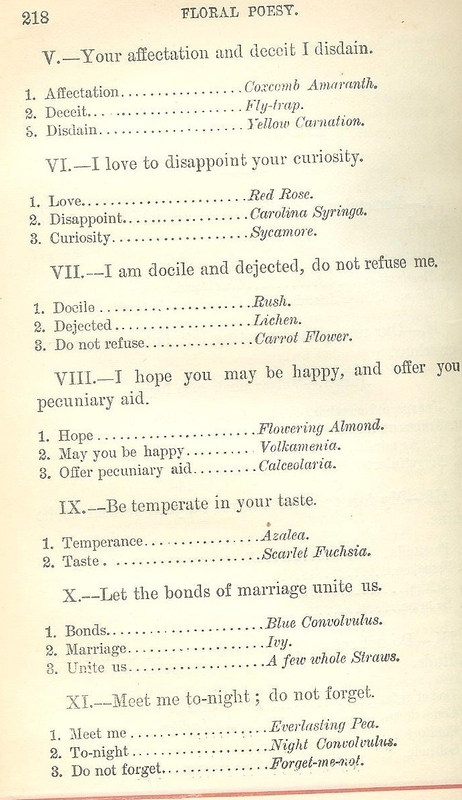 For example, if you wanted to say “Let the bonds of marriage unite us,” you would choose the following flowers for your bouquet: blue convolvulus (bonds), ivy (marriage), and a few whole straws (unite us). If you saw the movie KATE AND LEOPOLD, starring Hugh Jackman and Meg Ryan, you might recall the scene in which “Leopold” shows “Kate’s” brother how to choose a bouquet for his girlfriend. Sad to say, the language of flowers has faded with time. 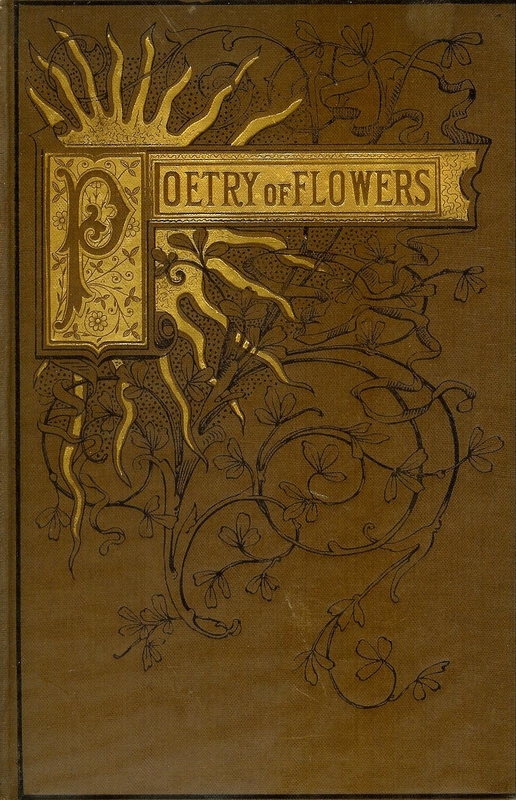 I would like to see the POETRY OF FLOWERS in print again as a runaway best seller. This entry was posted in Christianity, films, inspiration, romance and tagged flowers have meaning, Kate & Leopold, language of flowers, Poetry of Flowers, romance on February 4, 2014 by Sheryl Wright Stinchcum. The church loomed before her like some aged monument preserving the memory of its founders. Clutching vines of ivy encrusted the walls and scaled the towering steeple, as if to hold the bricks in place and keep them from crumbling. Like sentinels, a pair of massive, gnarled oaks guarded the entrance. Timidly she unlocked the door and peered into the sanctuary, deluged with light from stained glass Palladian windows. Each was part of a series depicting the life of Christ from the Annunciation to the Resurrection. She walked down the center aisle, carpeted in red, towards the cross that loomed over the choir loft and dropped to her knees at the altar. Surrounded by all the trappings of spirituality, she prayed and pictured the throne of God, the “sea of glass,” the cherubim, and “the four and twenty elders” clothed in white. But the vision was short-lived. Like a clap of thunder, the specter of doubt jarred her with a question: What if her circumstances were accidental, not providential? What if coming to Fairfax was a mistake? She waved the notion aside and seated herself at the organ. A careful examination of the instrument found it nearly identical to the one she’d practiced her lessons on in Columbus. “What harm is there in playing the organ?” she asked aloud. Her words hung in the air, unanswered, undisputed, and soon “Bach’s Toccata and Fugue in D Minor” resounded throughout the sanctuary. She poured herself into the composition, mindless of time and place, until a rapping sound arrested her attention. Her eyes scanned the church before resting upon a stained glass window depicting the Crucifixion. Like a metronome, a branch was tapping the pane. As she resumed playing, the melancholy fugue fired her imagination, bringing “The Phantom of the Opera” to mind. A mental picture of Lon Chaney lurking behind one of the pews prompted the feeling that someone was watching her. To counter the thought, she abandoned the organ for the piano and played a hardy rendition of “Oh Happy Day.” But halfway through the song, a scraping sound sliced the air, immobilizing her fingers. Excerpt from THE PRINCE IN THE TOWER (pages 7 and 8). When I started writing THE PRINCE IN THE TOWER, I wanted to give the story a familiar setting with historical landmarks. I chose the City of Fairfax, one of my favorite stomping grounds. 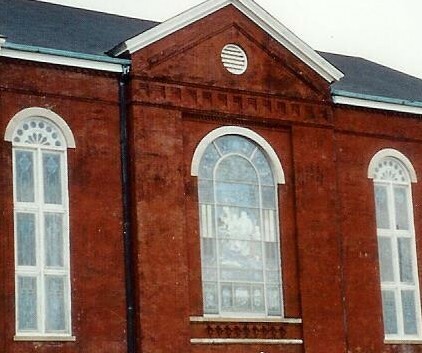 Most of the landmarks mentioned in the novel are real, but Providence United Methodist Church is fictional. The name “Providence” is not a coincidence. Not only does it mean God’s will, but prior to 1859, the City of Fairfax was known as the village of Providence. My description of Providence Methodist was partly inspired by the architecture of Berryman United Methodist in Richmond. Truro Anglican Church in the heart of the City of Fairfax influenced me also. 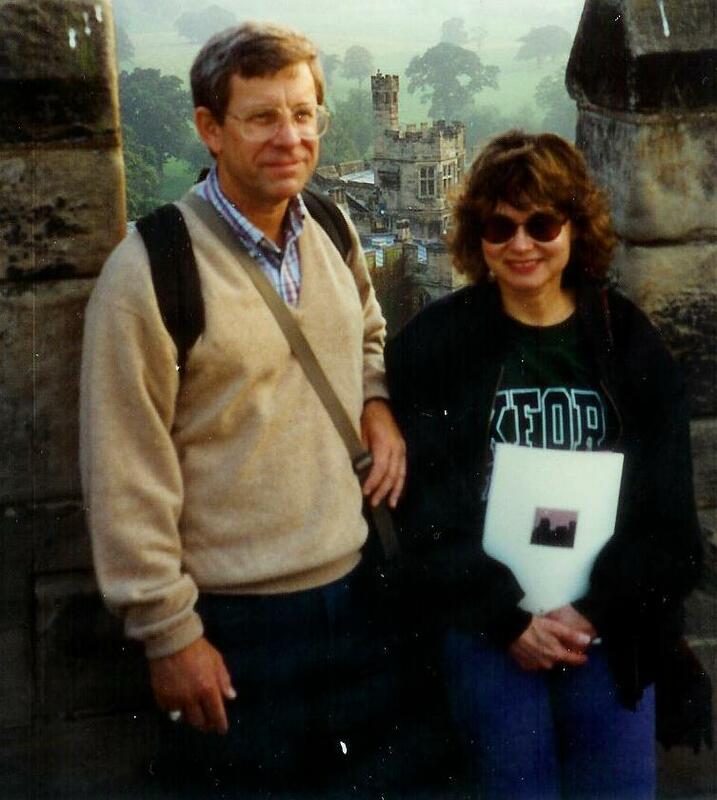 This entry was posted in Christianity, fiction, inspiration, novels, romance, THE PRINCE IN THE TOWER and tagged Berryman Methodist Church, City of Fairfax, Faifax Virginia, Fairfax County, ST ELMO, THE PRINCE IN THE TOWER, Truro Episcopal Church on January 14, 2014 by Sheryl Wright Stinchcum.